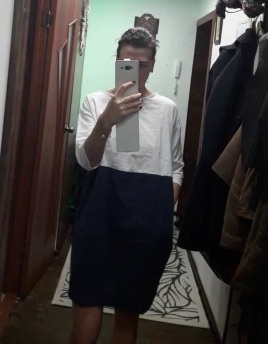 I like how this dress reminds me of a really cool oversized t-shirt. It's still feminine but not too try-hard. I throw it on with my Vans and I'm ready to go! What can I say, I love everything about this dress! It's boho yet modern and just so easy to wear. When I want to dress it up I just belt it at the waist and add jewelry and it's as simple as that. I'm a fan of color blocking since it's an easy way to incorporate color into an outfit. This dress has such a great design since it looks good but my favorite part is how comfortable and lightweight it is.